Gaining a deeper understanding and capturing new behaviours that are emerging, particularly from high capacity organisations that are innovating and mainstreaming new practice. Read more about CaDD here. The PACT tool gives organisations a detailed analysis of their capacity to take climate resilient decisions as well as guidance on their optimum next steps to improve that capacity (there is also a PACT tool for climate change mitigation). This guidance takes the form of a tailored action plan to develop the organisation's capacity that builds upon what they already do well. PACT can be used for many purposes, ranging from reviews of single organisations to multiple organisations that form a system of organisations. Those organisations who complete an online PACT inquiry receive a tailored roadmap showing how they can move directly from assessing the status of their climate change programme to planning improvements in it. Provides a benchmark of an organisations progress on addressing current and future climate change. 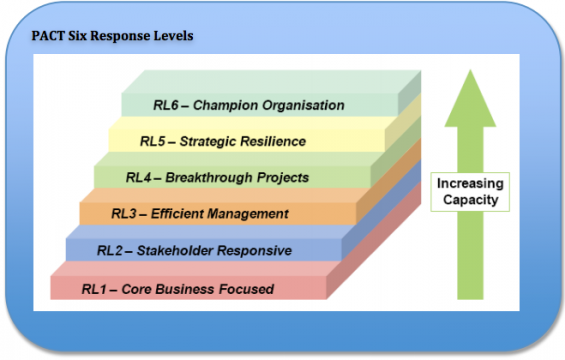 Helps organisations understand the challenge they face, and the level of capacity needed to address it. Shows organisations how to improve their approach to addressing climate change. Uses what an organisation already does well as a foundation on which to develop new approaches. PACT works as well for multi-national corporations as it does for local authorities. PACT is used by single organisations, departments within organisations and groups of organisations working in partnership and can be used across every economic and social sector. Providing climate change and change management consultants with a delivery plan for their clients. PACT provides organisations with a comprehensive benchmark of their adaptive capacity and a detailed description of their next steps to develop that capacity. The online tool allows this to be done quickly, efficiently, and at comparatively low cost. The benchmark of capacity can be used for monitoring progress and reporting internally and externally. The PACT Action Plan defines an innovative plan of action. 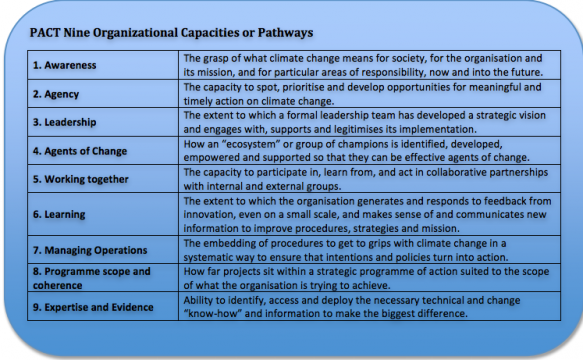 PACT dissects an organisations climate change capacity challenge into manageable chunks, and has been independently reviewed by UKCIP as being the most comprehensive tool in measuring and developing adaptive capacity. PACT informs organisations what needs to be done, it cannot define exactly how they should do it for every circumstance. The Alexander Ballard debrief is therefore highly recommended in order to assist with translating it into specific circumstances. Organisations log-in to an online interactive PACT Inquiry. They are then asked questions about how climate change information is used and managed in their organisation, paying specific attention to nine key complementary organisational capacities critical for climate resilient decision-making: awareness, agency; leadership, agents of change; working together; learning; operational management; programme scope & coherence; and expertise. The interactive inquiry tailors its questioning based upon the answers being given. This ensures that the questions being asked remain relevant and meaningful to the particular organisation completing the inquiry. Once the PACT inquiry has been processed by experts, the results provide each organisation with an understanding of the level of climate adaptation capacity the organisation has (i.e. 'adaptive capacity'), and what capacity it needs. If there is a gap between these two positions (which there almost always is) PACT provides a detailed description of the capacity development challenge the organisation faces, and the optimum next steps to address that gap. PACT is able to do this for organisations that are just starting out on the agenda right through to those who are leading the way. Organisations who have completed a PACT Inquiry receive a PACT Summary Report, outlining their challenge (aimed at top team / board level discussion), and a PACT Action Plan, detailing the actions they are doing well, those they are partially doing, those that are planned, and those that are not implemented yet but need to be (aimed at delivery management level). These reports are combined with a debrief of the results, the reports, and what they mean for the organisation from one of Alexander Ballard Ltd’s PACT experts. 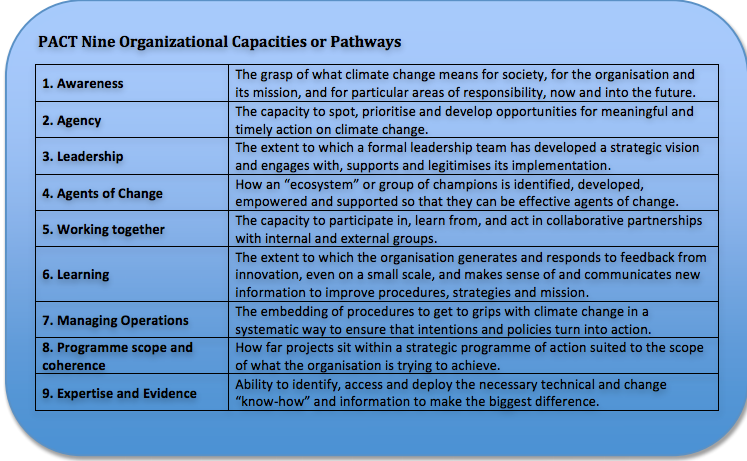 This gives an organisation not just a map of their path to climate resilience but teaches them how to read it. It is only at the point of making decisions that organisations can decide to do things differently. The capacity of organisations to make climate resilient decisions remains scarce. Yet organisations, by their very nature, are responsible for some of the largest climate vulnerable decisions that there are. Most organisations will be vulnerable in some way or another. In an effort to support climate resilient decision-making there is a growing and vast quantity of information about climate change and climate impacts, and the types of technology and options available to address them. This valuable information and associated technologies are essential parts of the solution. However, PACT recognises that the availability of information and technology does not necessarily lead to raised awareness about the agenda and how to tackle it. Likewise, even if awareness is raised, it does not necessary lead to any meaningful action. PACT provides organisations with a route map on how to use information to raise awareness that leads to meaningful actions that apply appropriate technologies accordingly. PACT helps organisations design strategies that will lead to the changes they need to make in order to make climate resilient decisions. PACT was developed by Alexander Ballard Limited (www.alexanderballard.co.uk) who are leading experts in the field of strategy development and organisational and systemic change management.